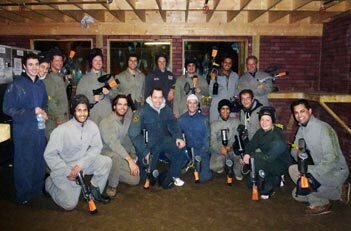 The Inaugural Paintball Competition was held in the Division of Plastic & Reconstructive Surgery at Sergeant Splatters, Monday November 12th. 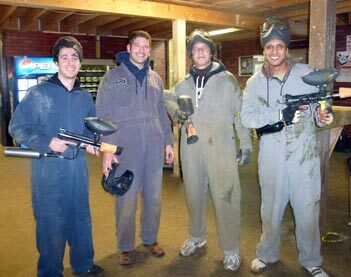 I just wanted to thank those of you who were brave enough to venture to Sergeant Splatters on a wet Monday evening to participate in the Inaugural Division of Plastic & Reconstructive Surgery (soon-to-be) Annual Paintball Competition, Kunaal Jindal for the concept and Kathy Pavlovic for doing all the organizing. The observant amongst you will notice the James Bondlike pose of Dr. Stefan Hofer, the angelic face on Victoria that belies her killer instinct, the two-hand grip of Dr. Greg Borschel who can't wait to start shooting, the twist ties at the bottom of Homan's overalls and me with my mental age group getting prepped on how to avoid getting shot. I obviously didn't listen well as the welts and bruises on my back can attest. For those of you who couldn't attend, I hope to see you at the next event. I think luminescent name tags are a must so that you can identify who it was that shot you.